Shop Raxxess ESD Sliding Steel Rack Drawer from AMS with 0% Interest Payment Plans and Free Shipping. 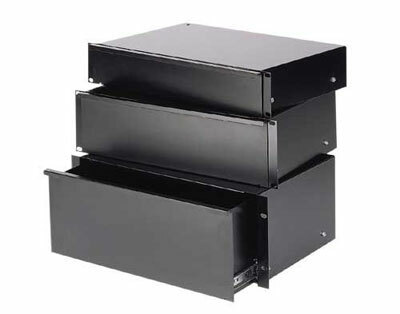 The Raxxess Sliding Rack Drawer features fully-enclosed construction of 16-gauge steel with a black powder coat finish. 12-inch cabinet grade slides allow for full extension. This rack drawer is perfect for anything from pencils, papers and strings to cassettes, cds and tools. Newly redesigned, Raxxess rackmount drawers now feature a laser cut knockout on the front panel for adding a key lock at any time, as well as a laser cut knockout in the rear for cable passage should you want to store an electronic device in the drawer. In addition, this drawer now features a fully welded drawer body for maximum strength and stability. Recieved today, when I opened the box I was totaly impressed with the quility of this product. Just as good or better as rack drawers costing much more money. This drawer is perfect! It fit right in to our rack case, and holds all of our wires along with one other drawer that we have mounted in the case. It has solid construction, looks great, and is well worth the money. I have just set up a mobile DJ system using rackmount I now have over 20,000 Watts and this whole rack system is set up to be used with turntables. So I needed a drawer for the speaker and mic cables in this drawer works perfect at the bottom on my Mobil rack!